Photographic copy of an engraved view from SW.
View from south east of Musselburgh Tolbooth. 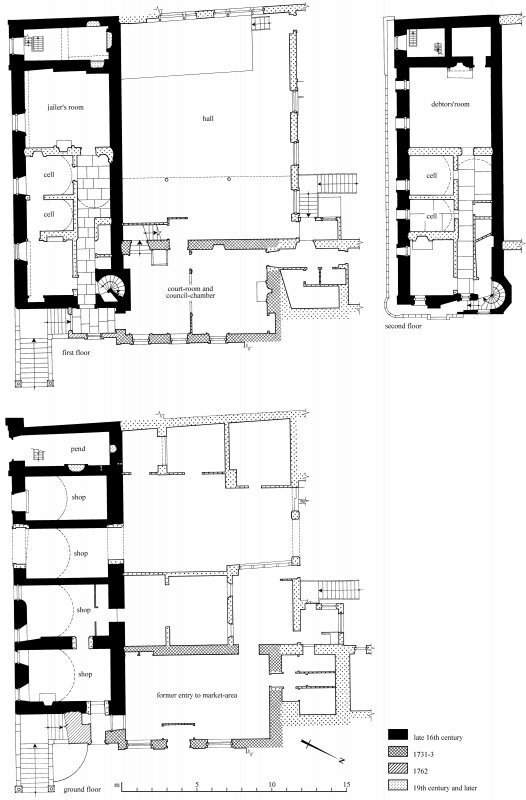 2nd floor plan Preparatory drawing for 'Tolbooths and Town-Houses', RCAHMS, 1996. 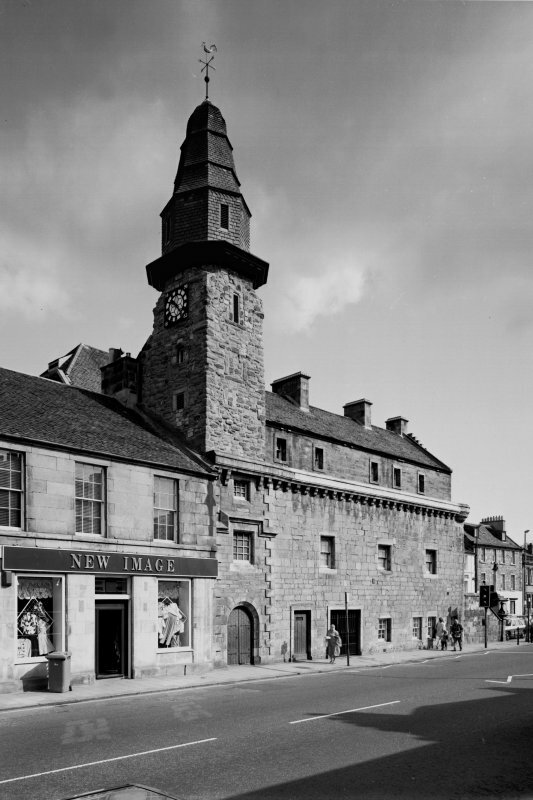 N.d.
Musselburgh Tolbooth, a long, narrow, 3-storey block, was built c. 1590, and altered in 1773 and 1875-6. The square tower at the W end may be a survival of an earlier tolbooth, destroyed by the Earl of Hertford in 1544. The restorations to the building have robbed it of much of its character. 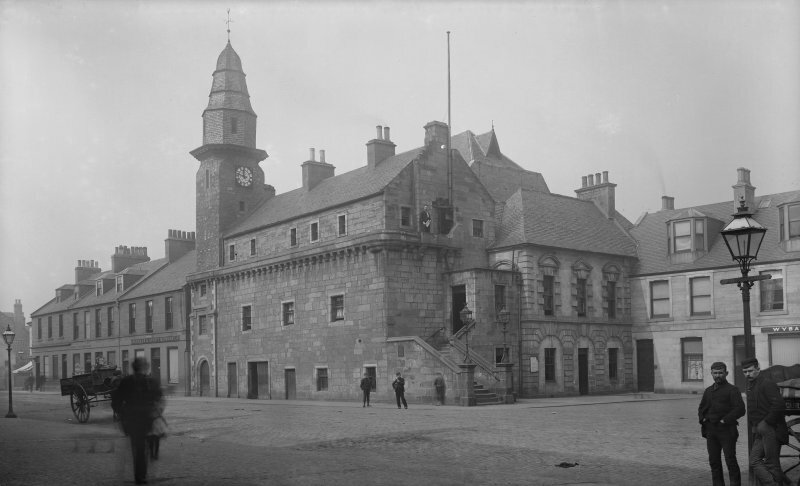 The Town House, adjoining the E end of the tolbooth at right angles, was built in 1762. 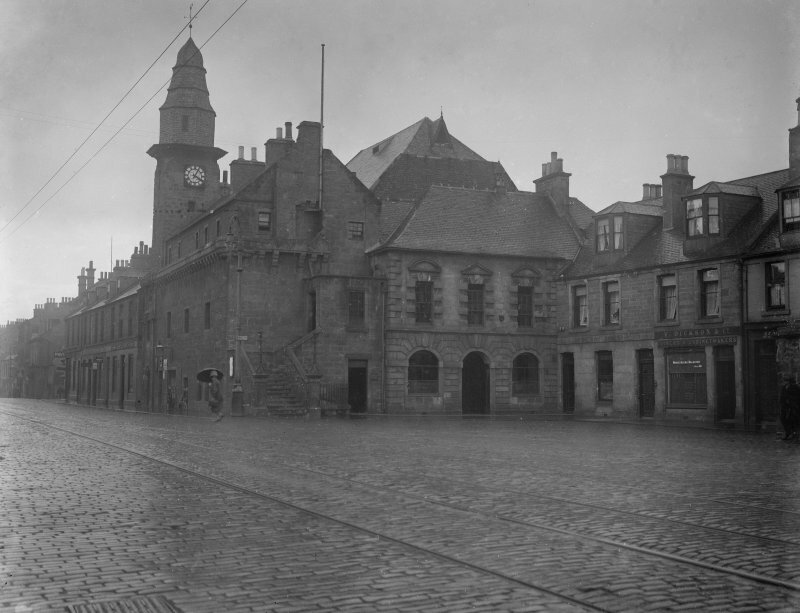 Musselburgh Tolbooth and Town House are as described above. The oldest portion is the tower on the W (save for the steeple, which is modern). The remainder of the building has been considerably restored. Non-Guardianship Sites Plan Collection, DC28392- DC28393, 1909. The tolbooth occupies a prominent position on the N side of the narrowest part of High Street, to the W of a broad area containing the reconstructed mercat cross. The distinctive tower with its octagonal spire rises within the SW angle of a rectangular castellated block of late 16th-century date. At right angles, to the NE, there is a two-storeyed Palladian courtroom wing of 1731-3, and in the re-entrant there is a large 19th-century hall. The original rectangular block measures 19.2m from E to W by 7.4m and is three-storeyed. It is built with squared rubble in courses of varying heights, much renewed in 1827, 1885 and later, and the window-surrounds of the lower storeys are chamfered. A corbelled parapet-walk, with a SE angle-round, runs along the Sand E walls and encloses the third storey. Although its windows have been renewed in the 19th century, this level is probably contemporary with the lower floors. Its E gable includes a chimney-breast which is corbelled to allow access from the cap-house to the parapet-walk, and the skews show evidence of the heightening of the wall-head that was ordered in 1758. The copings of the two mid-wall chimneys and that of the E gable bear dog-tooth and billet ornament which, although renewed, is of 16th-century character. 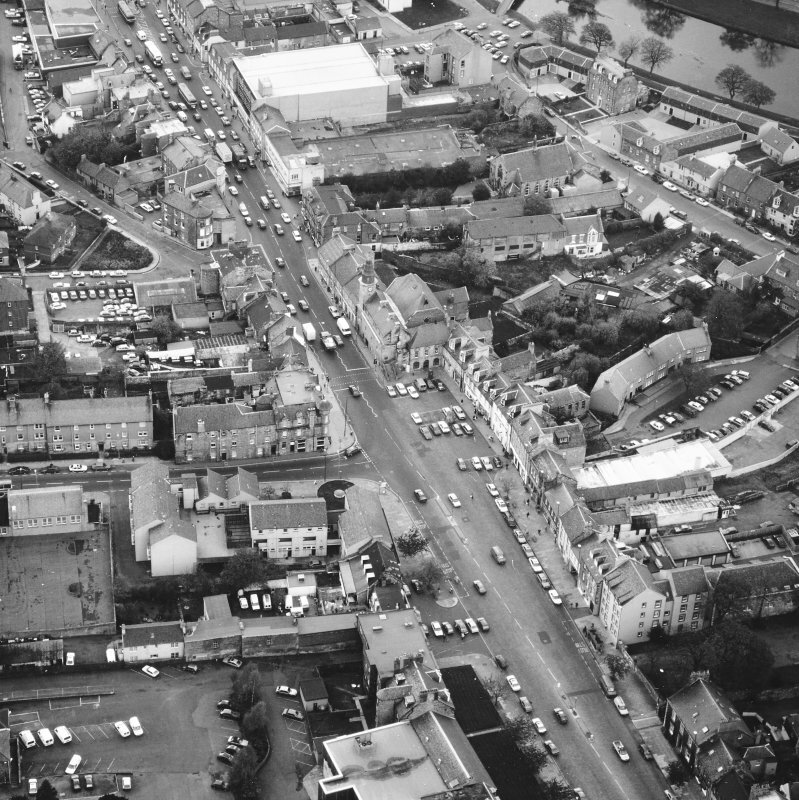 It has been assumed that the rubble-built tower is a survival of the tolbooth that was destroyed in 1544, but the comparative slightness of its walls does not support this analysis. The slight projection of the wall-front below, which contains the arched entrance to a former pend, and the stepped moulding above the first-floor window, are consistent with a late 16thcentury date. Above parapet-level the tower is 3.1m square as far as the clock-stage, where its angles are bevelled to support an octagonal modillioned timber platform, perhaps dating from repairs in 1744. This carries the octagonal slate-hung belfry and an ogival slated spire which is divided by stringcourses into three stages. The ground floor E of the tower is divided into fourtransverse vaults, which from an early date were used for shops, but one was opened in the 19th century to form a pend. The first-floor entrance to the upper floors was probably always at the N end of the E end-wall, and a newel-stair rises immediately inside it to the N, while at the Wend of the second floor there is a fireplace of possible 17th-century date. The doorway was enclosed in a porch in 1762, and in 1773 the council ordered a marble slab to be set 'above the doorhead of the entry to the prison '. This bears the burgh arms flanked by the inscriptions: 'Magistrates do justice / in the fear of God, Ju(ne) 16 / 1773', and 'He that God doth fear / will not to falsehood lend an ear'. In the first half of the 19th century the interior was extensively altered. Pairs of vaulted cells were installed on the first and second floors, served by axial vaulted corridors. The vaults are constructed in ashlar and the complex system of airvents appears to be contemporary. The cell doors survive intact, as does a stove-recess in the first-floor corridor. Rooms at both the E and Wends of the building were left unvaulted, presumably serving as jailers' rooms and a debtors' prison. 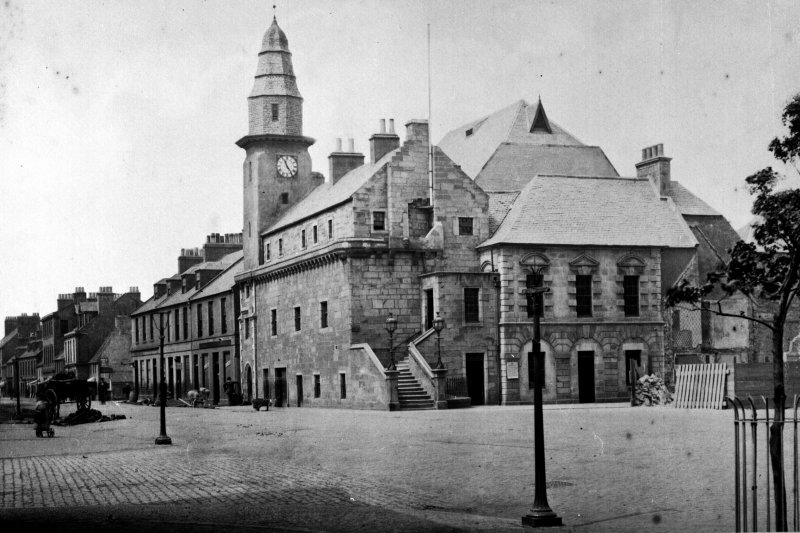 The wing that was added to the NE angle ofthe tolbooth in 1731-3 is two-storeyed and measures about 11.5m by 7m, with a narrower extension to the N. The N end of its E front is overlapped by an adjacent building, and the exposed part is treated as a symmetrical three-bay frontage 8.5m in width, with the roof hipped to the S. The ashlar of the E and S fronts was refaced early in the 20th century. The ground floor, which is of channelled ashlar, was originally the arcaded entrance to a market-area, and the infilled arches have bold imposts and keystones, while the first-floor windows have Gibbs surrounds with pediments, triangular in the centre and segmental in the flanking openings. The doorway in the S wall had a head of the latter form, But in 1762 the forestair was rebuilt, with a moulded stone coping, and the doorways of both wings were enclosed in a two-storeyed porch which retains a date-stone above the S door and a moulded window-surround to the E. The upper floor of the wing originally contained a single room, which was used both for courts and council meetings, but in the 19th century it was subdivided, with the S half becoming a lobby to the public hall, and the W-facing windows were blocked or altered. To the N it opened into two rooms in later extensions. In 1811 instructions were given for the 'long room to be widened for a ball room', and this may refer to the present hall, built in the angle of the tolbooth and the court-room, which measures 15.5m by 11.8m and has a brick-built N wall above a stone-built ground-floor arcade. It was further altered in 1875-6, and the blind but glazed Venetian windows of the W gable probably date from William Constable's alterations of about 1901. In the lobby of the NE wing there is displayed a clock mechanism which was reputedly gifted to the town by the States of Holland in 1496. A new clock was made and installed by lames Ritchie, Edinburgh, in 1901. In 1822 a Dutch bell dated 1619 was given in part exchange for a new bell cast in London, whose present location is not known. In 1544 the tolbooth of Musselburgh was 'more or less destroyed' in Hertford's invasion. The ancient burgh was reerected into a burgh of regality for the commendator of Dunfermline Abbey in 1562. Ten years later the bailies and council began to build adjacent to their tolbooth 'ane hous to have for thair counsalhous, a warding place and a place of pressoun for keping of malefactouris'. Servants of two local landowners destroyed the building-materials and forcibly resisted the watchmen. The outcome of this dispute is not recorded, but the existing building may well belong to the 1570s rather than to the traditional date of 1590. 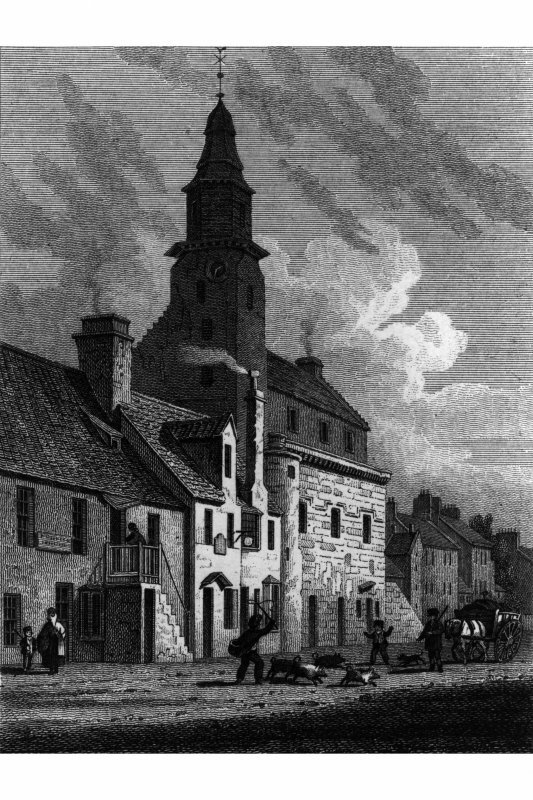 Later tradition held that stone for the new tolbooth came from the ruined chapel of Loretto, situated about 0.6km to the E. It was also recorded that, according to masons still living in 1792, the old steps to the tolbooth were the bases of pillars from the chapel, but no such re-used masonry is identifiable. There is little record of building work in the 17th century, but the steeple was repaired in 1700 and 1744, and in 1758 the tolbooth roof was raised and reslated with ' blew' slates in place of 'gray' ones. One of the omissions in the design appears to have been a fireplace in the council-room, and in 1716 a 'brace' or fireplace was requested by the councillors for use during cold weather. In 1731 ground was enclosed 'at the back of the tolbooth for a new Mercat place and for building a new Court place above the entry their to to enter off the present stair of the Tolbooth'. The new wing was built by lames Crighton and completed in 1733. The widening of the 'long room' for a ball-room in 1811 was carried out to the designs of lames Hay. During the 19th century the ground floor of the tolbooth was used as a policestation, and a pend was formed through one of the original vaults when access to the courtyard behind was blocked by the construction of a shop in the arcade under the court-room. In 1885 the walls of the town-hall stair were rebuilt and polished pillars of Dalmeny stone installed at the bottom of the stair. The work carried out to designs by the local architect William Constable in 1901 included general improvements to the building as well as the enlargement of the public hall. The tolbooth figures 8 & 22.C is one of the oldest surviving in Scotland. 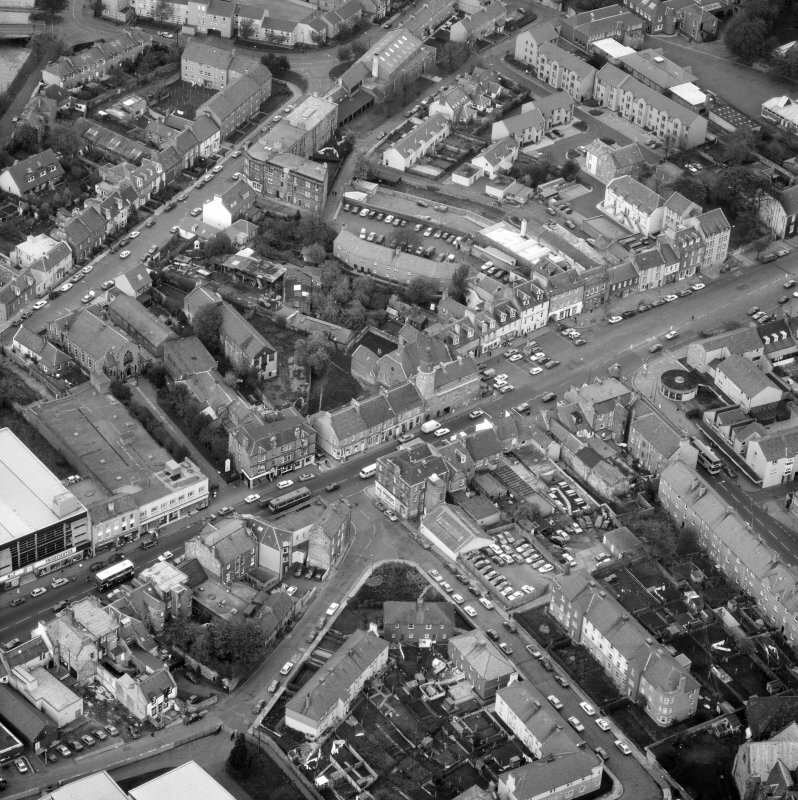 It was here that tolls, or market dues, were collected, the burgh council and court met and miscreants were imprisoned. Being the most important municipal building, it stood in a central position in the townscape. It features in the records as not only a symbol of civic pride, but also a constant drain on the finances of the town (see pp 39-40). 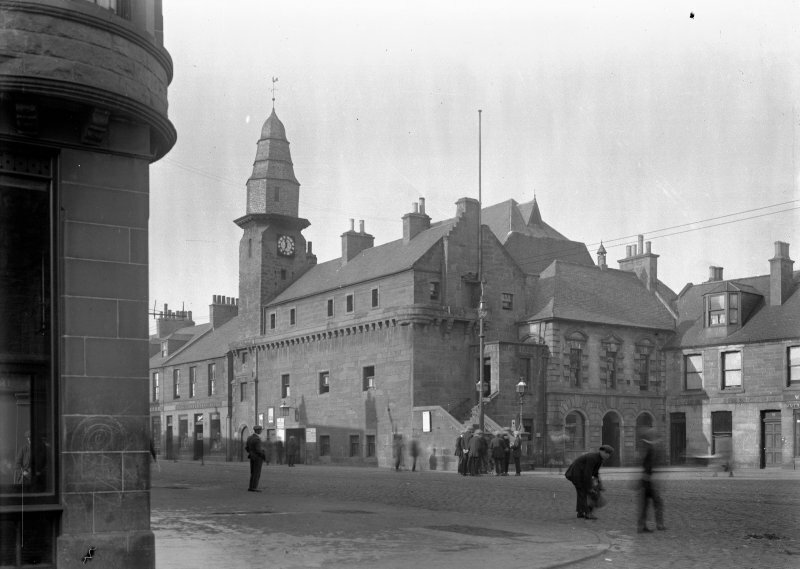 The main three-storey portion of the tolbooth dates, probably, to c 1590, when major alterations were effected, possibly using some of the stones from the demolished Loretto chapel. The tower is of earlier origin, having apparently survived the burning by the Earl of Hertford in 1544. It was in this earlier steeple that the town clock was lodged, a present in 1496 to the people of Musselburgh from 'the Dutch states', a telling comment on the town's trading contacts, as is the roof style of the tolbooth. The clock and its workings, now removed from their original position, may still be viewed in the first floor entrance hall. The open parapet walk may have seried as a perambulatory for prisoners. 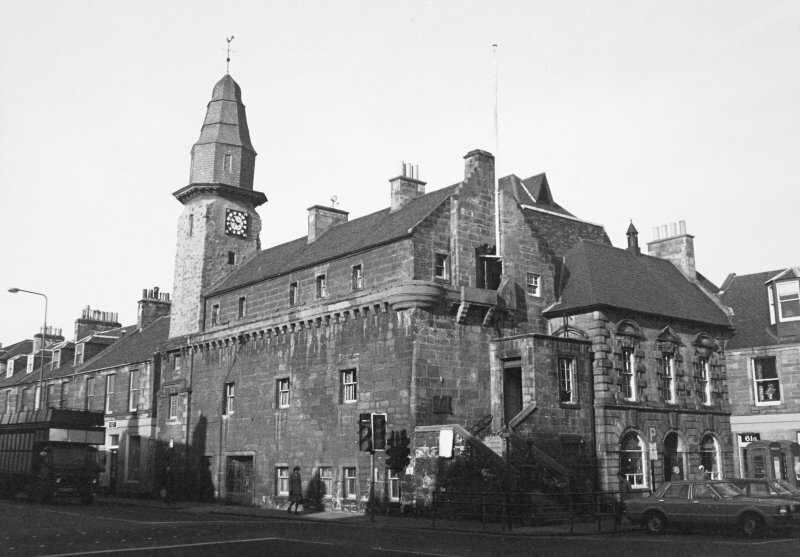 The tolbooth continued to function as a prison into the twentieth century. 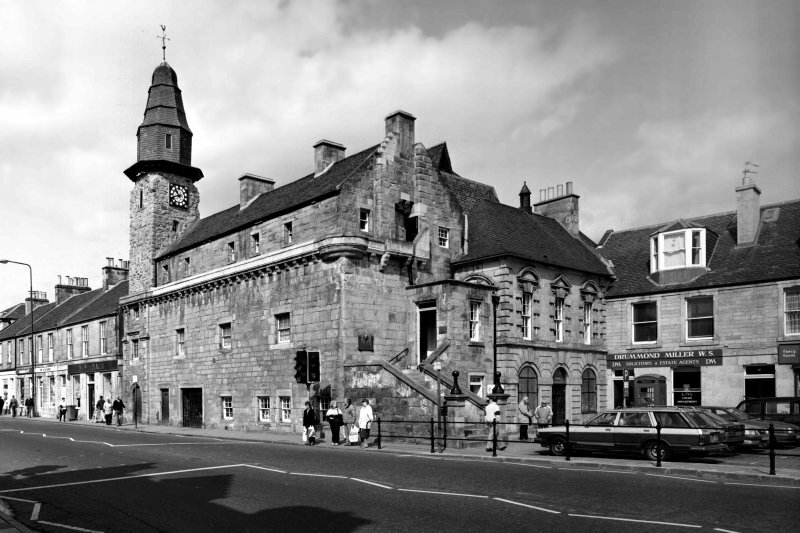 Attached to the tolbooth is an elegant two-storeyed council chamber wing or town hall. This was added in 1762 and the marble plaque erected in 1773 (see p 39) may be viewed inside the first floor entrance porch. Being one of the oldest standing buildings in the burgh, it is highly likely that archaeological remains are preserved both beneath and within the tolbooth. These may survive as a sequence of floor levels associated with earlier phases of the tolbooth, or as deposits which predate the construction of the building itself. 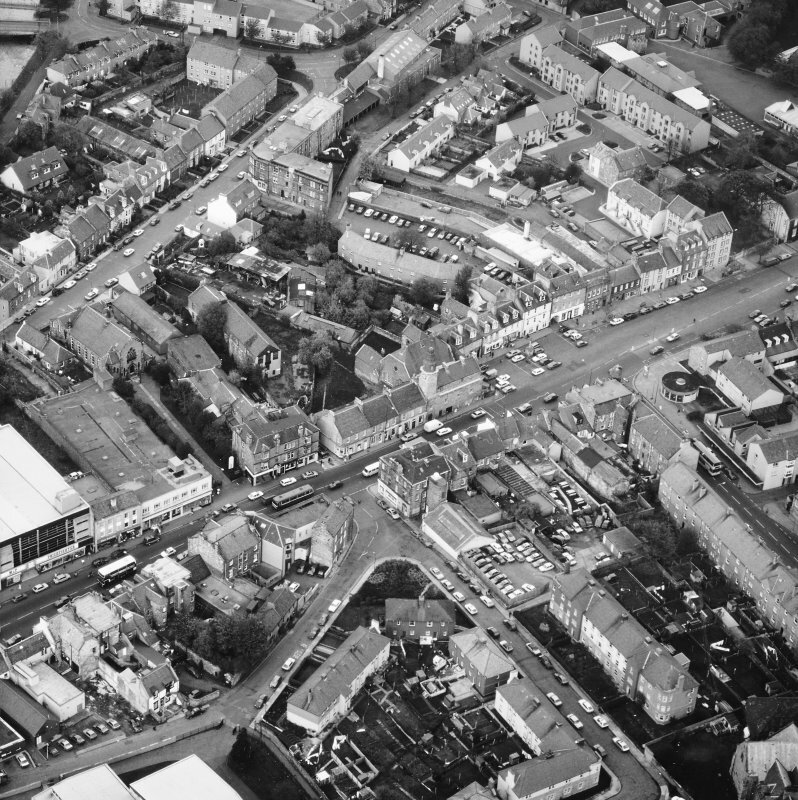 Information from ‘Historic Musselburgh: The Archaeological Implications of Development’ (1996).